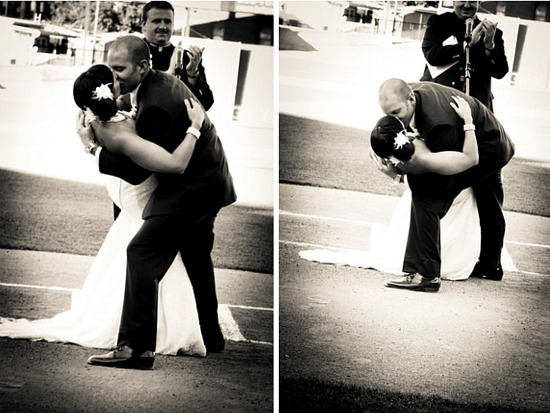 Today's Real Wedding was submitted to me from a faithful reader of my blog who married her hubby while they stood on home plate in a baseball stadium. She writes that the location paid "homage of sorts to the place we were when we realized we were meant to be." 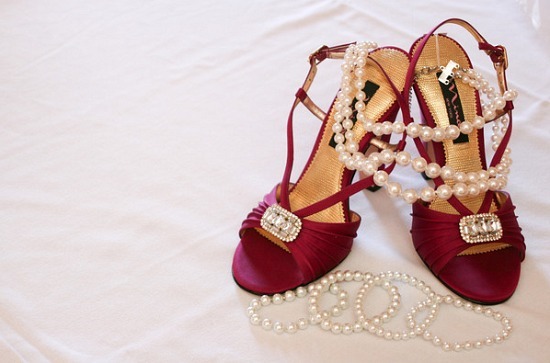 Captured by Kate Photography took the beautiful photos of Taryn and Kevin. Baseball had played a major role in Taryn and Kevin's relationship - Kevin has played baseball from little league to college and when they first met, the spring season had just started. They were engaged during baseball season and right after that, Taryn secretly contacted the York Revolution Independent Pro team to make arrangements to get married on the field. She then told Kevin they were getting married on home plate. Taryn and Kevin wanted to keep costs low and their vendors worked within their budgets, and they also creative in stretching their dollars. 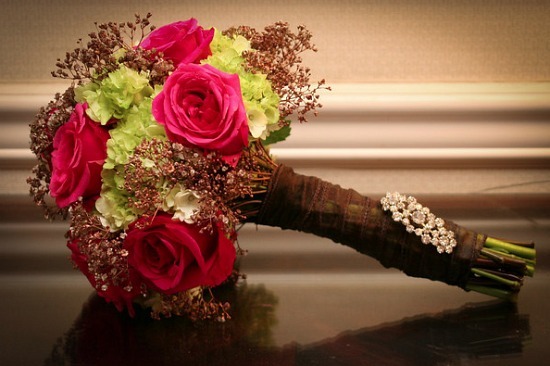 For example, instead of expensive berries, they spray painted the baby's breath in the bouquets. They also made their own seating cards, aisle decorations, and centerpieces. 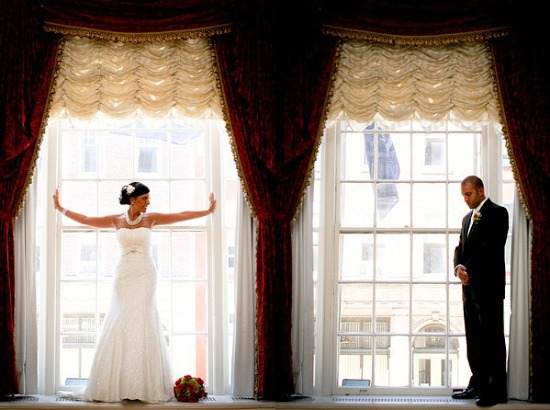 They opted for the 30 person limo bus instead of two smaller limos to be more cost effective - and as a gift, the grooms step brother created custom music video dvd's to keep the ride fun. 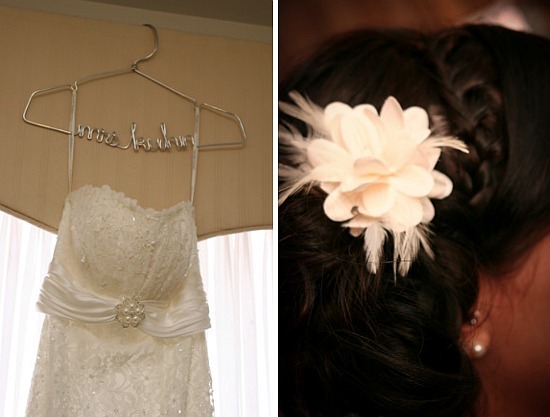 Taryn bought an off-the-rack wedding dress and glammed it up with a brooch and chunky jewelry. They also made their own backdrop and bought props for a mock photobooth instead of renting one for 10x the cost. 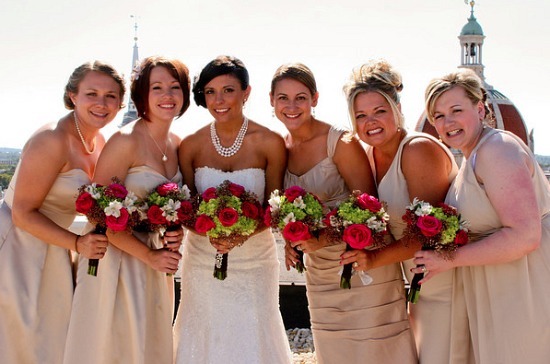 I love the following 3 shots of the bridesmaids with the bride - and again, I'm seeing the bridesmaids in the same color, but a different style that suits each one individually. This is one of my favorite trends. To keep with the baseball theme, custom tickets were created to include with the invitations and instead of traditional programs, they had lineup cards and stadium style booklets. The invitations and programs were designed by Taryn herself. 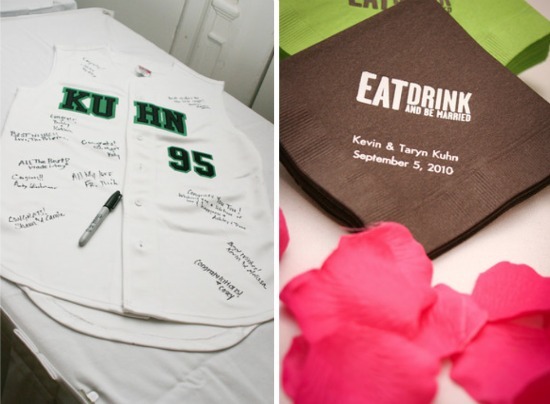 Their seating cards were baseballs, the guestbook was a custom baseball jersey, and favors were custom beer Koozies. And, I just LOVE this idea . 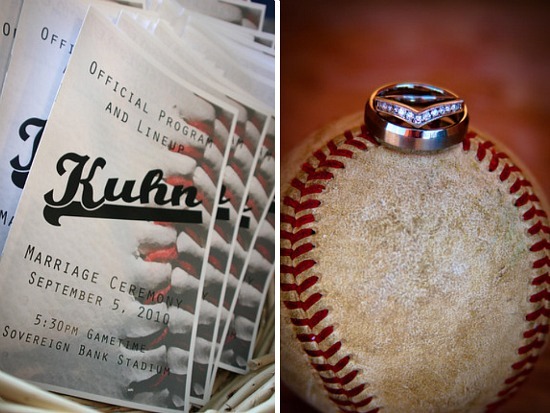 . . the ring bearer carried a baseball glove down the aisle. The photo(s) below are definitely one of my favorites as it's actually 2 photos the photographer took that were taken with the purpose of being placed side by side. To dance the night away, Taryn and Kevin changed into hot pink and brown chuck Taylors. Taryn and Kevin even kept with the baseball theme the night before their wedding and had their rehearsal dinner in a suite at the game where Kevin threw out the first pitch while their names were on the jumbotron. And lastly, I just have to leave you with these words from Taryn, the bride, as she sums up her wedding just perfectly: "Looking at our beautiful pictures, you would never be able to tell that we were a thrifty couple throughout the planning process. We were able to creatively keep costs low, while still having a unique and very fun wedding. We didn't skimp on things like the open bar, photography, or DJ because they were very important to us. However, things we could do on our own - we did. Competitive spirit I guess. Everything we did was a true representation of us as a couple. The day was the absolute best day of our lives." Thank you so much Taryn and Kevin for sharing your special day with my readers today and to Captured by Kate Photography for the lovely photos.